The formerly opening page of MS Paris, BNF, lat. 7641, now bound in MS Vatican Library, Vat. Reg. lat. 566, f. 50, contains a drawing in the tradition of the carmina figurata. The carmen is a Titulus sancti Marcelli. This page has been considered as a sort of book-plate. However the poem is a dedication of the MS to Vulfinus, the author of the Vita sancti Marcelli. Theodulf of Orleans, who appears to be connected with the text tradition of the works collected in the volume, could be the author of the dedication poem too. Vulfinus could be a friend of him, who came with him from Northern Italy to France and who, after Theodulf fell out of favour with the Court, ended his life as a grammaticus at Orle´ans and in touch with Florus of Lyon. The Paris MS, which was in the library of Reims by the mid 9th century, was read by Sedulius Scottus, who made use of it for Publilius Syrus, Sentences, and was annotated in German tongue, with excerpts from the German traslation of Tatian and the Pariser Gesprache. The latin kings of Jerusalem used to send relics of the True Cross to ecclesiastical institutions and prominent laymen in the West as sign of their sacred power and of the needs of the Holy Land. This practice was fostered by king Amalric (1163-1174) who sent a precious pectoral cross to the abbey of Clairvaux after the battle of al-Babein in 1167, when the king was admonished and saved from death by a vision of saint Bernard himself. The text of the whole story (In memoria aeterna) was written on a parchment attached to the precious reliquiary – now lost – made in Clairvaux, but it was also preserved by several manuscripts of the Vita prima sancti Bernardi. A longer version of this text was copied among the letters of canonization of Bernard of Clairvaux in the Clairvaux manuscript Troyes, Mediathe`que du Grand Troyes 6, ff. 2r-3r; this copy is of particular interest both for the crusader propaganda and for the shaping of Bernard’s image in Clairvaux on the eve of a major crisis of the Cistercian identity. The origins and configuration of two notions as important in linguistics as those of agreement and government have yet to be clearly established. Through a diachronic analysis ranging from the 4th century BC to the 12th century AD, this paper addresses this gap in the history of linguistics. 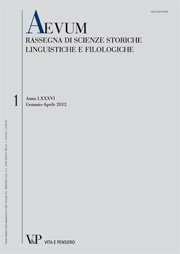 The study uncovers the relatively unknown origins of both concepts and, for the first time, systematically analyses the various contributions and steps leading to the definitive formation of both types of syntactical relation, with a particular focus on the most current and influential. Robert Grosseteste (Bishop of Lincoln from 1235) translated in Latin some entries of the Byzantine Lexicon known as the Suda, a translation which is still unpublished. This paper investigates the textual transmission of Suda’s translation. In the first part Grosseteste’s learning and knowledge of Ancient Greek are briefly outlined. In the same section his other translations from Greek are also discussed. A description of the extant manuscripts of Suda’s translation is provided, as well as a catalogue of the items (pertaining to a separate textual tradition), which are found in Grosseteste’s notulae of his doctrinal, literary and scholarly works. Special attention is paid to the so-called Lexicon Arundelianum (a Greek-Latin Lexicon – but entirely written in Latin – transmitted by MS London, College of Arms, Arundel 9). Grosseteste sometimes combines several Suda’s items and/or inserts in the original Lexicon text some entries of the Etymologicum Gudianum. Moreover Grosseteste’s translations are extremely literal (verbum de verbo). Finally, MS Leiden University Library, Vossianus gr. F 2 (12th cent.) is proved to be the Suda Greek manuscript used by Grosseteste for his translation. The archives of the Humiliati are here studied as a resource to understand the complex problem of the identity of the Order. Attention is focused on the ways the Order administered its archives and a member of the Order (Giovanni da Marliano of Brera) made use of them, writing the history of the Humiliati. Medieval documents of the Order from the Milan area have been inspected; most of them are now in Milan, Archivio Storico Diocesano and Biblioteca Nazionale Braidense and in the Archive of the Seminario Arcivescovile of Milan (now in Venegono Inferiore). The study of the many endorsements, added on the documents in the late XIVth and XVth century, proves that several persons in charge collected the documents from different Lombard houses of the Order, moved them to the house of Brera, then arranged, classified and had them copied in cartularies, which had to serve as historical sources. Verse on the months often go with calendars in several types of liturgical books: they may be intended for teaching and mnemonic purposes or may be longer and narrative. A short poem of this sort is copied in a 15th-century breviary (Milan, Cathedral Chapter Library, II.D.3.6), which was probably commissioned and is largely annotated by Francesco Della Croce (1391-1479), vicar of the archbishop of Milan and an expert liturgist. The same little poem is also printed in an incunable of the Ambrosian Missal (Milan, L. Pachel, 1499). No other witness is known. It is a leonine verse. Illustrations in paintings and miniatures and other medieval Latin poems offer loci paralleli, similarity and common sources. Some passages are close to the Carmina de mensibus, written by the Milanese poet Bonvesin da la Riva. A full inspection of the incunabula preserved at the Newberry Library, Chicago, made it possible to select volumes with ancient bindings. Their contents were taken into consideration together with all the information useful to reconstruct their history such as ownerships, ex libris and other annotations. Special attention was paid to the pastedowns and flyfleaves, as a topical and constant marker, strictly connected to the original binding. All the bindings with pastedowns and flyleaves taken from liturgical MSS written in Italy were selected, and they turned out to be bound in 15th- or early 16th-century Italian bindings. These bindings and liturgical fragments, eight in number, are here described. There are three Antiphonars, two Legendaries, a Bible, a Missal and a Homiliary from different regions of Italy and from the 12th and 13th century. Varino Favorino Camerte’s Magnum ac perutile Dictionarium (printed at Rome, 1523) is the widest Greek lexicographical compilation edited in Renaissance Italy. The most important source of the glosses of the psi group is the Lexicon of Hesychius. Several lemmata are too rare and erudite for didactic use, and the absence of a Latin translation shows that the Dictionarium aimed at preserving the Greek language rather than at providing help to Western beginners. The Preface is here reprinted and translated into Italian. The exemplar of the editio princeps owned by the Biblioteca Ambrosiana was a gift of Cardinal Reginald Pole to Wimborne College (Dorsetshire).